The racing game is a more specific category of game on Gamestar Mechanic, but designers have found a lot of ways to apply and improve on the genre. Racing games require the player to navigate a course quickly, reaching a finish line before time runs out. It takes some skill to keep a racing game interesting, because the avatar must rush through many obstacles before reaching the goal. Checkout this top-down racing game driven by two threatening system sprites: The energy meter makes the player race between pit stops (spots where energy is refilled), whereas the timer requires the player to complete the whole course in time. Space: The space in a racing game is the track, the routes by which the avatar completes the level. The track’s shape, size, and thickness all contribute to the feel of the game — keep the components of your game in mind, and design your game’s space to fit. 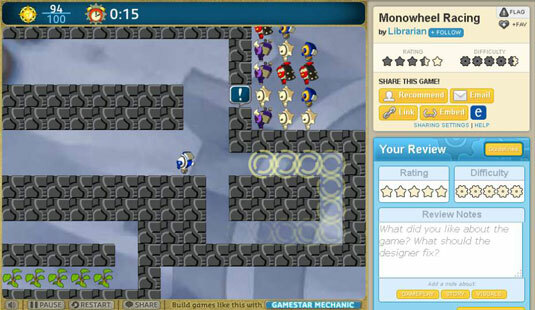 Rules: Use blocks, enemies, timers, and other elements to efficiently enforce the rules of your game: no leaving the track and no running out of time. The element of rules isn’t quite as important unless you want to add special rules. You can define the rule set for a racing game in many ways, but even a simple, balanced timer can produce a well-defined racing game. Goals: The goal of most racing games is to reach a certain point (the finish line). Closely connected to a rule, the goal is the simplest part of a race. However, you can always add your own innovations by having the player run multiple laps, for example, or frag enemies along the way. Components: The base components of a race are the player, the track, and the finish line. Sometimes these components are sufficient if you fill out the track with frequent challenges and points of interest. Other components — from damage to pit stops to other racers — can make for a more interesting experience, but these additions require you to implement new mechanics, which can affect the structure of your level. Mechanics: The core mechanic of a racing game is the player’s racing mindset: The player must reach the goal as fast as possible and act with urgency and agility. To improve on this core mechanic, try adding enemies and other hazards to test the player’s reflexes along the way, or add other mechanics such as point-collecting and energy-gathering, which encourage the player to think fast.